Successfully Added Card MP3 Player 4GB - Credit Card Sized MP3 + WMA Player to your Shopping Cart. The Thinnest PMP in the market, this little Card 4GB MP3 and WMA Player is credit card is so thin and light it can easily fit into a normal card slot in a wallet (not that you would want to keep this great Card MP3 Player there!) It is a great item to show off to your friends, and is sure to wow your customers at its small size, but great sound. Shopping with Chinavasion means that you can get this item with no Minimum Order Quantity and a 1 Year Warranty, perfect for everyone from drop shippers and resellers, to those who just want this thin Card MP3 for themselves or for someone else. Want Your Own Brand On This MP3 Player? 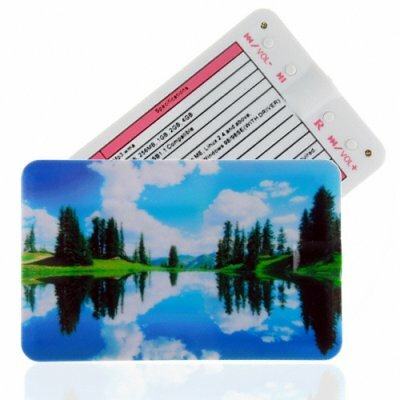 Don't settle for just the plain white version of this ultra thin credit card size MP3 Player... Why not add your own company logo or a design of your choosing? Begin by ordering at least one plain item as a sample. After you are satisfied with your sample, contact us to request a special quotation and to send a sample of the image that you want added. Quote your past order number and this product's item code. We will get back to you with special prices for your volume purchase, and how to check out your order securely and conveniently. No added fees for putting your logo / picture on the product! The minimum order quantity for putting your own brand / logo / image on this model is 200pcs. Your discount prices will be even lower than the prices you see listed in the online shop..
stand out. Also a great corporate or promotional gift.